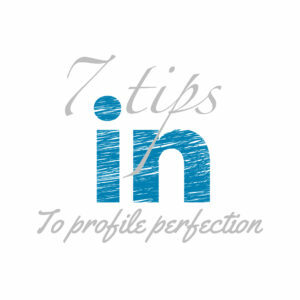 7 Tips to LinkedIn Profile Perfection (Part 1) - Need a New Gig? I am excited to bring you this new, three-part series that will not only help freshen up your LinkedIn profile for your job search, but will also give you a great understanding of LinkedIn to help build a strong network for future endeavors! When candidates are looking for a new position, they tend to focus the majority of their efforts on writing the perfect resume or searching through thousands of job postings. What if I said that you might have better luck landing your next role if you tweaked your LinkedIn profile? Today, more and more employers are using LinkedIn not only as a way of recruiting, but also as a quick screening tool. You want to make sure that your profile is pristine at all times, but most importantly when you are actively looking for new employment. Essentially, your LinkedIn profile is a live, always-on, always-accessible copy of your resume and a representation of you. I still cannot believe that LinkedIn has been around for over ten years! I will never forget that day, at my first recruiting firm, when I signed up. My colleague and I were trying to increase our networks and at the time, our boss thought it was a waste of our efforts. Funny – as LinkedIn now rules the recruiting scene! At any rate, seeing that it has been around for over ten years, many of us have fallen by the wayside when it comes to updating our profile, and specifically our picture. We all know that one connection that still has their original ten-year-old profile photo! Let’s face it, people change over time. It is important to have a relatively current picture to give employers the most up-to-date representation of you. The type of picture that you have is also very important. Typically they best type of photo is a color headshot in work attire. Now I know that we all do not have a professional photographer on hand (or the spare cash to shell out for a LinkedIn photo shoot), but there are other options. Today’s smart phones take pretty solid shots. I recommend recruiting a friend or family member to help you out. Find a solid/neutral wall to use as your background to keep the focus on you. Dress up in your best work attire and make sure that your outfit doesn’t blend in with your background. Try and stand in a relaxed position and go with what feels natural. Give a great smile and you are all set! You can take a few snaps with your arms folded, hands in your pockets, or even on your hips and chose the one that you think looks best. Once you have your new picture, you will need to change it on your profile. Here’s how. Click on “me” in the bar in the top right hand corner. A drop down menu will appear, giving you the option to view your profile. Once on your profile, click on the “pencil” icon on the right side of your picture. This will open up a box which will allow you to upload your new photo. LinkedIn also has the option to add a background photo. It is up to you if you would like to add an image. Personally, I use the standard background for the sake of simplicity, as I like the focus to remain on my profile picture. If you want to change your background photo, it is recommended to use an image that that isn’t too flashy. Again, you want the focus to be on you! Another thing to remember is to be sure that you follow the image requirements and double check your picture after you add it. Since the dimensions are different then your profile picture, your image can get distorted or cut off. 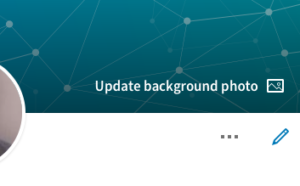 To change your background image, simply click “update background image” when on your profile. So now that you have a great shot for your profile picture, what’s next? Aside from just having a picture, LinkedIn also gives you the option to add in an overall summary or intro directly below. This information is editable in the same place we previously changed your photo. It allows you to change everything – including headline, current position, education, summary, etc. We will walk through each one. To edit this information from your profile page, click on the “pencil” icon next your photo. First and foremost, make sure that your name is spelled correctly and is in the right format. This may sound silly, but if you have not updated your profile in a few years, some information could be in the wrong place due to site changes and updates. I have come across profiles in the past where a person’s last name is first, or it is in all caps, and it is a bad look! Next is your headline. There are a few directions to go on this one. Some professionals believe that having a creative or unique headline will help you stand out from the competition. I agree, but I would caution you to be concise and to the point. You can add your specialty, accomplishments, or just some text to jazz it up a bit. A few examples would be “Driving Business as a National Sales Manager at Smith and Company” or “Top 30 under 30 eCommerce professional”. If a creative headline is not for you, I would go with the standard headline, and ensure that it at least reflects your current job title. Once your headline is complete, continue through the form updating your information to ensure everything is current and accurate. This includes current position, education, location, and your current industry. Finally, you will need to update your summary. This is a vital piece of your intro and it should be a short, yet detailed summary of your career. Try to keep it under 250 words but give a good overview of your accomplishments. This is a great place for numbers, percentages, or achievements you have had in your career. Use buzzwords that touch on previous experience, but also are relevant to the role that you are seeking. You can even add a short sentence at the end explaining your interests and/or your career end goal. If it has been awhile since you have updated your profile, chances are that your experience section may not be up to date and reflect your current position. You can add additional employers/positions to your experience by clicking on the “+” symbol when on your profile. If you have positions listed and you need to edit them, you can do this by clicking on the “pencil” icon next to that particular role. Since your profile serves as your live resume, it is important to show your career history/progression, and also provide information that explains what you have accomplished. Once you have added your previous companies and positions, go back through and add a brief description of each role. You can even pull some of this information from your resume to save time. Remember – you will have a better chance of being found by employers and recruiters by adding in buzzwords and specific experience that they may be looking for. Length is something to consider when updating your experience on your profile. Most professionals will tell you that your resume should be around 2-3 pages, max. The same thing holds true with your profile. If you had an internship or entry-level position at the beginning of your career that isn’t relevant to your current experience, you should get rid of it! The rule of thumb is to allow your past few positions to sell your background. Ideally, you should include your past 7-10 years of experience to give someone a quick, to-the-point overview of what you can do. If you have made it this far, your profile is already looking solid and I guarantee that it will make a difference when it comes to looking for that next position! Stay tuned for Part Two, when we finish adding/updating the basics and cover ways to add skills and accomplishments to your profile! This entry was posted in LinkedIn and tagged #job search #jobseeker #socialmedia #professional, #LinkedIn Profile, LinkedIn. Bookmark the permalink. There are three parts to this series, so be sure to check them out! You can also share blog posts on LinkedIn as well. It is a great source of traffic for us! Great post! I often forget about my linkedin account and it is badly in need of a brush up! Depending on your audience, it is also a great source for traffic!